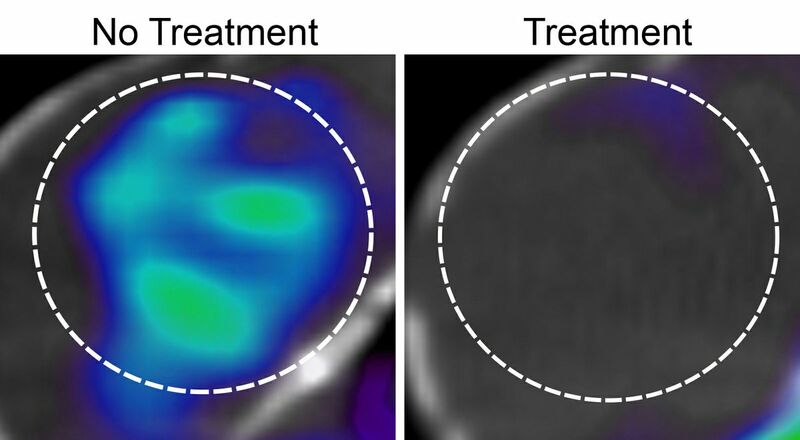 Positron emission tomography images show glioblastoma tumor glucose uptake before, left, and after treatment in mice. UCLA scientists have discovered a potential combination treatment for glioblastoma, the deadliest form of brain cancer in adults. The three-year study led by David Nathanson, a member of UCLA’s Jonsson Comprehensive Cancer Center, found that the drug combination tested in mice disrupts and exploits glucose intake, essentially cutting off the tumor’s nutrients and energy supply. This treatment then stimulates cell death pathways — which control the cancer cells’ fate — and prevents the glioblastoma from getting bigger. The combination treatment works by manipulating sugar metabolism with the FDA-approved drug erlotinib against one of the most common genetic alterations in glioblastoma, a cell surface protein known as EGFR. The researchers found that erlotinib treatment reduces sugar uptake in the majority of glioblastomas studied, thereby creating a metabolically vulnerable state for these brain tumors. The researchers then exploited this metabolic deficiency with an experimental drug called idasanutlin, which activates a protein called p53 to promote glioblastoma cell death and stimulate tumor regression in mice. 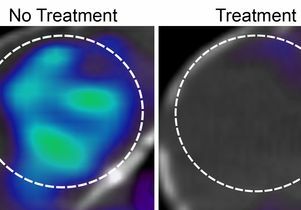 Nathanson and his team also demonstrated that positron emission tomography, or PET, imaging can predict which tumors would respond best to this combination treatment. These findings build on previous research by Nathanson, who was a co-author of the initial study in 2013. That research showed that EGFR genetic alterations promote sugar uptake in glioblastomas. The researchers also found they could not directly attack sugar metabolism in the brain, due to potential side effects, since normal tissue requires sugar to survive. Glioblastoma is one of the most lethal human cancers, with a median survival rate in adults of just 15 months after diagnosis. Researchers conducted the study using 19 human glioblastoma cells from different people. Some of the cells were implanted in the mice to analyze the effectiveness of the drug combination treatment. The researchers used PET imaging to predict which tumors would benefit from the drug combination. The researchers also used an assay, or an assessment tool, developed by collaborators at Harvard University to measure how close a brain tumor cell is to the death threshold while targeting sugar metabolism. The next stage of research will be to test the combination treatment on people with glioblastomas in clinical trials. Eventually, the researchers might design a new strategy involving the combination treatment that would attack and kill the glioblastoma altogether. In addition to Nathanson, who is an assistant professor in the department of molecular and medical pharmacology at the David Geffen School of Medicine at UCLA, Dr. Timothy Cloughesy, a professor in the department of neurology at the David Geffen School of Medicine at UCLA and director of neurological services and the neuro-oncology program, is a co-author and member of UCLA’s Jonsson Comprehensive Cancer Center. Other co-authors are Peter Clark, Steven Bensinger, Harley Kornblum, Dr. William Yong and Jason Lee, all members of the cancer center; and Nagesh Rao, a professor of pathology at the school of medicine. Wilson Mai, a graduate student at the school of medicine in the department of molecular and medical pharmacology, is first author. The study is published online in the journal Nature Medicine. Funding was provided by the National Cancer Institute/National Institutes of Health, the Uncle Kory Foundation, the B. Hasso Family Foundation, the Spiegelman Family Foundation in memory of Barry Spiegelman, and a seed grant from UCLA’s Jonsson Comprehensive Cancer Center.